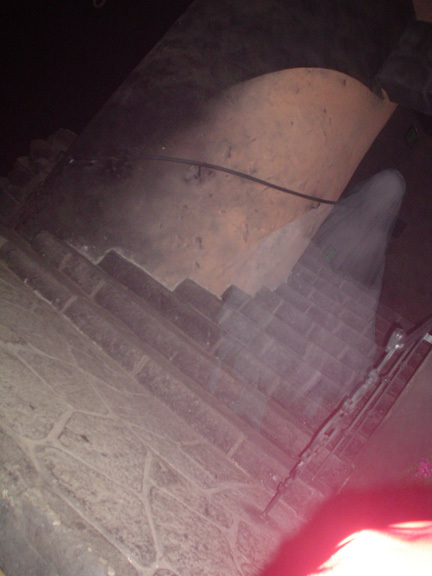 What is the billowing figure on the staircase? What could it possibly be? We contacted Wendy the Disney Psychic and asked her to analyze the vibrations of the individual pixels in this digital image. According to Wendy, the figure is the animatronic spirit of the previous bridal inhabitant of Disneyland’s Haunted Mansion. Some months ago, this pour soul was displaced from the attic by a “new and improved” bride, and because it was unable to pass into the next world (there are no automatons in Heaven) or follow its animatronic body into Imagineering storage (for union reasons), it has become trapped in the mortal plane of existence! Disney’s California Adventure will continue to be unsuccessful unless significant improvements are made. Roy Disney will eventually settle his differences with the Walt Disney Company. Pirates of the Caribbean II will be successful. Financial analysts will have inflated expectations for the next Pixar film. DisneyLies.com is proud to announce that we have entered into an exclusive contract with Wendy. We will be featuring her predictions on this blog as they become available, and will make a big deal whenever one of them comes true.